Little boys absolutely love toy guns. Toy guns are to little boys what dolls are to girls. Almost every boy has fond memories of playing cowboys and Indians, or cops and robbers with his favorite toy guns as a child. The only difference now is that there are so many incredible options to choose from. Back when I was a child there were very few good toy guns to choose from. It was just your typical cowboy type guns and rifles. Although we’d use our imagination more than modern kids do! These days you’ll find fun toy guns available for almost every sci-fi, adventure and action movie that’s been made, from star wars, to star trek. There are a lot of different type of guns to choose from, like water pistols and airsoft guns and even potato guns. The fun thing about all the different types of toys available is that you can find almost any play gun for your kid depending on their mood that day. They can play modern armies, classic armies, space battles, cowboys or cops and robbers. Your kids imagination won’t be limited by the choices. If you already know what type of gun you’re after for your child then you can just scroll down to read the individual reviews, but if you want to learn more about all the different types of toy rifles and guns that you can buy online today, then read on to learn more. There isn’t just a simple list of “top 11” guns for children, since there’s so many different types. There isn’t a single best option. Instead, I’ve chosen 11 great options for all the different types available, rifles, machine guns etc. This toy gun really looks the part. It weighs 7.2 ounces and it’s for 5 years and up. It’s got electronic lights and sounds for added realism so you’ll need 2 AA batteries with it. The scope is removable and the cylinder actually revolves when the trigger is pulled. It’s particularly light, so it’s good for young children too. This is by far one of the coolest toy shotguns around. It comes with 4 play shells which your kid can actually load into the toy shotgun, and when fired, they’ll eject out just like a real gun. It’s made of plastic, but it’s got a very realistic, wood grain effect on the handle. The max action is 1.8 pounds, so it’s still a light gun and is suitable for any kids 5 years and up. It needs a couple of AA batteries which will power the realistic sound effects, which will add to the fun for your child. These types of guns for 5 year olds are ideal gifts and are fun to use. This is an incredible water pistol. In fact, it’s called a water BAZOOKA it’s that powerful. It can shoot a double stream of crystal clear water up to 60 foot. It’s got a really solid, smooth build and feels nice to handle. It’ll also float in water so it can be used in the swimming pool or at the beach. This water bazooka is actually perfect for a vacation with the kids. You can buy a couple of them and take your kids down to the beach for hours of fun and exercise. The Aqua toy guns are for 8 year olds and with easy to use handling it’s a good choice. 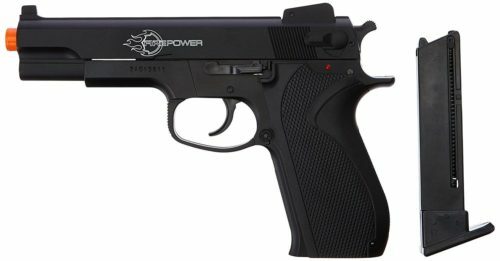 This is one of the best airsoft pistols you can get, but remember, airsoft pistols aren’t for children. They are for teens, age 16 or 18+ depending on your state. They WILL cause a red mark on the skin even through clothing and goggles are absolutely mandatory for ANY airsoft usage. But if you’ve decided that an airsoft gun is what you’d like to get, then I highly recommend the firepower .45. Not only is it cheap, small, portable and really sleek-looking, but your teens be able to have hours of almost real-like combat. This particular gun is spring powered and has a velocity of over 300 FPS. Overall it’s a good gun. Remember to check your local state laws before ordering. 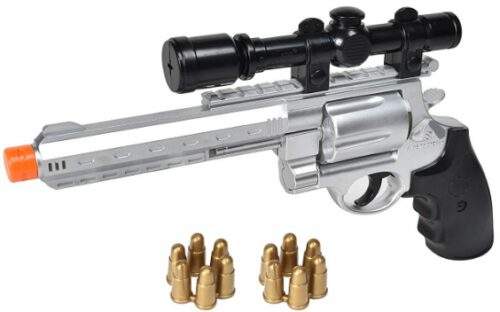 If you are looking for a toy shooting gun, this is the perfect choice. The Nerf gun can hold 25 darts, shooting them at a rate of 3 per second. It also features a tripod which can be removed for easy transportation. This is one of the best Nerf guns for children aged 8 years old and above. It is fully automatic, to give kids a great advantage over their opponents. Shots can also be fired singly for great accuracy. The gun includes an ammo box as well as the darts and belt. If your kid wants to play armies then you’ll want to buy him a toy machine gun. These are the coolest toy guns available today. They are generally built really well, being big, solid and all in black except for the red tip. These are a little more dangerous and only for older kids(16+). Airsoft guns actually fire low velocity, non-lethal 6mm to 8mm plastic pellets. They weigh around 0.12 to .45 grams and travel at velocities of 150 up to about 600 feet per second. This kind of guns give older teens the opportunity to play war games outside with each other and actually be able to keep score of hits against each other. There are of course some safety concerns to take into account and I recommend that teens should have full, long-sleeved shirts, pants and gloves. Airsoft guns will leave a light red mark even through clothing and safety goggles MUST be worn at all times. Water pistols have been around for years and allow kids to actually shoot each other in complete safety. Even the high-powered water guns are completely safe and won’t leave any marks or cause harm. Cap guns are great for making loud noises and for certain kids the realism is to die for. The look of these guns can also be quite realistic, which has led to strict laws about their production. Either the tip or the entire gun should be in bright colors, to differentiate it from a real gun. There are different types of caps which can be used with these guns, most commonly they take the form of plastic round discs today. The guns are based on revolvers, although shooting them is harmless. 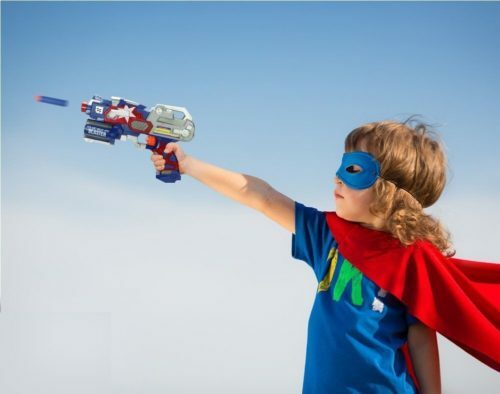 Cap guns are great for realistic role-playing – the sound and smoke effects are sure to be popular with kids of all ages. The shootout game cowboys and Indians is a classic kids shoot out. Usually the cowboy has a pistol to fire and the Indians will have a bow and arrow to fire back. Both of these toy guns for boys are fun, but one uses wood to fire and the other uses steel and metal, so it easy to decide for me which I’d go for. The toy cowboy gun needs a holster and if he is going to be shooting some Indians then he needs somewhere to hold his gun in between battle. Water guns are great fun for kids to play outside with and in the summer this is ideal. There are loads of different water guns and some can get really far in range which is fun for outdoor water battles. Squirting people with water is fine lets face it. The “Classic Water Gun Fight” never gets too old and kids as well as adults love it! Games like “Water Gun Capture The Flag” is a great party game for a kids birthday party. Water game target games are a cheap and easy way to keep kids playing outdoors in the garden for hours, which is why a water gun for playing outdoors is a great choice of gift for your child and you. A lot of different guns have darts with them and some are capable of firing bullets really far with some power behind them. Kids love these a lot and it adds to the excitement when they can watch the bullets whizz through the air fast. This gun in well-known in the army and the special forces and is a classic gun for kids to play with and feel like they are in the military. There is a special V force commander toy gun in this review and for those father in the military who want to prepare they’re kid for falling in line like them, then this might be an ideal toy gun. The guns for 12 year olds and older children are usually associated with bullets that fire at long distance and can cause harm if the gun isn’t given to an age appropriate child. Another special forces toys gun and there is no doubt that this weapon is one of the great guns, which in honour has been make for kids to enjoy playing with. Why not add in a little bit of history/education for your kid? Teach him a little about history by getting your boy a world war 2 toy gun. These guns are particularly striking looking, being more slender with the brown plastic handles that look like real wood. Swat guns are the way to go if your kid wants to play cops and robbers. The Uzi toy gun is known for blasting and spraying whatever is in close range and some kids love it because of the movies it sometimes appears in. The movie Rambo used them and my child liked the Uzi because his saw this appear in a scene. Laser guns are great toys and the cat would agree and with some of the lasers being very powerful this can be an excellent toy gun to play with a nighttime with friends. Lazer guns for 13 year olds and above are usually because they have dangerous levels of light strength and can cause damage if pointed directly into the eyes, so make sure to read fully the review before buying a gun. One of the most important things you need to get along with your toy gun are some accessories. The gun by its self isn’t that exciting, but when you pair it up with helmets, bullet proof vests, sheriffs badges, handcuffs and other toy accessories, then you a recipe for a fantastic fun, imagination fuelled weekend. This comparison table of out top 3 guns below help you decide from a quick glance what might be best suited for your child based on age without having to read the whole in-depth toy gun guide below.. Some people just know what their kid will love instantly.